Isaac (Hebrew: יִצְחָק, Yiẓḥaq; Arabic: إسحٰق, ʾIsḥāq ; "he will laugh") (2108 AM–m.2148 AM–2288 AM, or 1896 BC–m. 1857 BC–1716 BC) was the son of Abraham and Sarah, born when Sarah was supposedly beyond the age of childbearing. God had promised Abraham that his descendants would inherit the land of Canaan and be a blessing to all the world, yet Abraham had no son. Seeing that she was barren, his wife had him beget a son for her on her slavegirl (a legitimate practice of that time); that boy was Ishmael. However, God had determined to bring his promise about by means which were humanly impossible, so as to demonstrate that he was in full control. Isaac was born to Sarah when Abraham was 100 years old, and Ishmael was about 14. The name Isaac is related to the word for laughter, speaking both of the joy of a son born so unexpectedly, of the joy of the promise that he embodies, and also of Sarah's reaction when she heard the prophecy of his birth. The lives of Abraham and Isaac are rich in typology. One of the types is of the death of Jesus Christ at the will of God the Father. 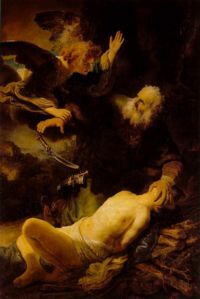 God commanded Abraham to go to a particular place, usually thought to be mount Moriah at Jerusalem, and there to sacrifice Isaac to God as a burnt offering. Since Isaac was strong enough to carry sufficient wood for the offering, he must have been a teenager and must have been strong enough to resist had he wished. (Indeed, Flavius Josephus held that Isaac was 25 years old at the time.) At the last moment, God told Abraham not to kill him but to use instead a ram that had got its horns caught in a nearby thicket. This story foreshadows both the willing sacrifice of Jesus by command of the Father but also the provision of Jesus as a substitute to pay the penalty for the sins of all the world. Isaac was married to his cousin, Rebekah, by an arrangement made by Abraham and blessed in its outcome by God. This marriage is a type for the coming marriage of the Lamb to his bride, the church. Isaac and Rebekah had two sons, Esau and Jacob, when Isaac was 60 years old. These two are also typologically significant, in particular of the fact that God is not constrained by human preconceptions but will choose whomever he will. Thus, God arranged for the promise to descend through the younger son, Jacob, rather than through his elder brother. Isaac died at the age of 180 years. His sons Esau and Jacob buried him in the Cave of Macpelah. This page was last modified on 12 July 2016, at 16:19. This page has been accessed 13,142 times.